Hey, hey, hey! It’s appetizer week on OSK. All week long I’m serving up easy, fast, whole foods holiday party appetizers. Each recipe is either ready in 30 minutes or less, or can be prepared mostly or completely in advance. Some are both 😉 That’s my kinda party prep. Today’s edition? Gingerbread spiced nuts! 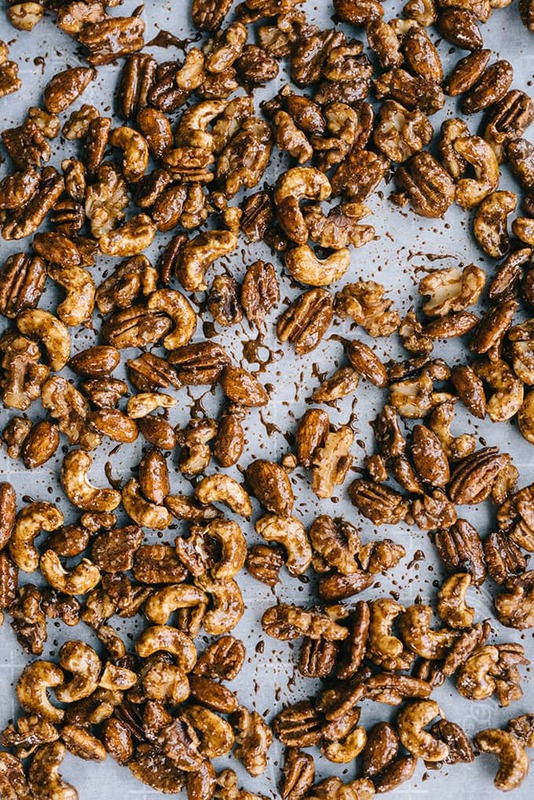 No cocktail party is complete without some sort of spiced nut offering (or two…or three). I like to divide them into small bowls and place them randomly throughout the house on end tables, countertops, buffets tables, and other ledges so that my guests are never too far away from a nibble. 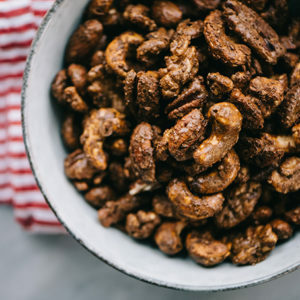 These gingerbread spiced nuts are sweet without being cloying and hit that perfect balance between spiced and salted. They have a pleasant snap and a very definitive gingerbread flavor. The prep time is minimal, and they can be made completely in advance and set aside for up to 5 days in a sealed container. Easy and fast. Yummy and seasonal. In lieu of the traditional brown and/or white sugar that most sweetened spiced nut recipes employ, I went with coconut palm sugar to keep these relatively healthy and completely paleo. Coconut palm sugar is the dehydrated sap of the coconut palm flower. It has enough sweet to mimic traditional refined sugars, plus it’s sustainable and environmentally friendly. I can find it at my local grocery store, but I usually buy it in bulk on Amazon. You want to buy raw nuts for this recipe – raw nuts will likely be pasteurized, but they’ll be unsalted and unroasted. 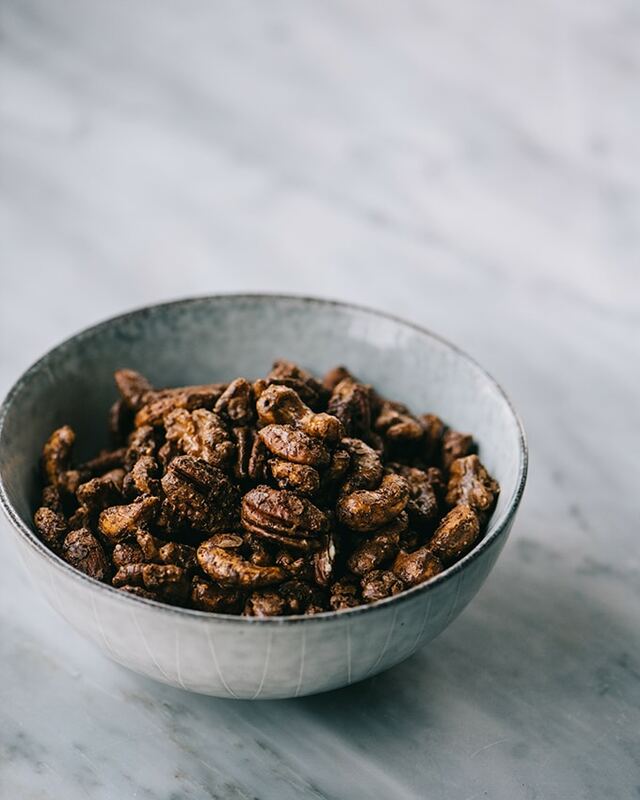 You can go with any nut or combination of nuts of your belly’s desire – I used pecans, walnuts, almonds, and cashews. They’re all a similar size and roast in roughly the same amount of time. 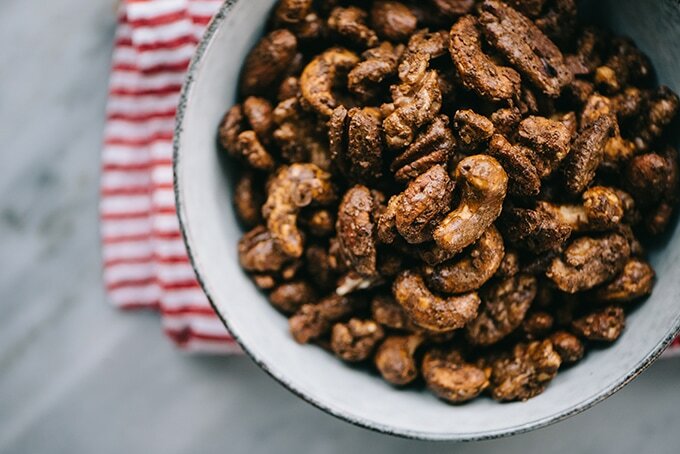 Avoid peanuts to keep this recipe completely paleo. 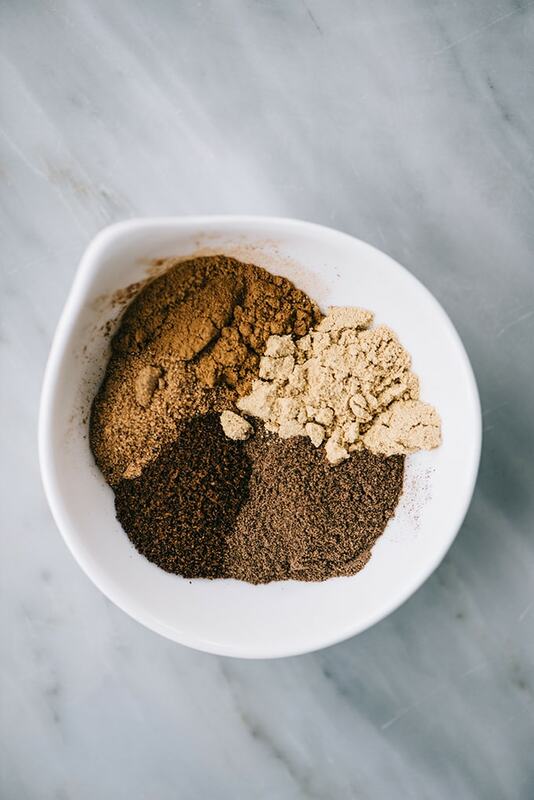 We start out with a gingerbread spice blend of cinnamon, ginger, allspice, nutmeg and cloves. You can make your own (I did, simply because I had all of the spices on hand) or purchase a small container of readymade gingerbread spice from the store. Next, grab an egg and separate the yolk from the white. Beat the white until it’s frothy and the bubbles are small and uniform. 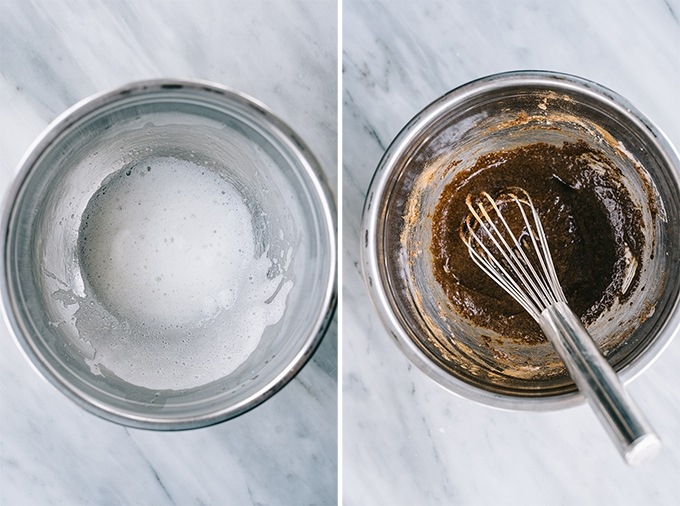 Just when you think it’s frothy enough, whisk it just a little bit more. Then add the coconut palm sugar, gingerbread spice blend, and salt, and give it a whisk until it’s incorporated. Add the nuts to the egg white mixture and fold with a rubber spatula until they’re completely and evenly coated. You can also use your (clean) hands, but this is a messy job and a spatula totally gets it done right. Pop those guys into the oven and roast ’em at 300*. At the halfway mark, you need to stir them to ensure they roast evenly. To do so without cursing my name, remove the baking sheet from the oven and do this on the countertop. 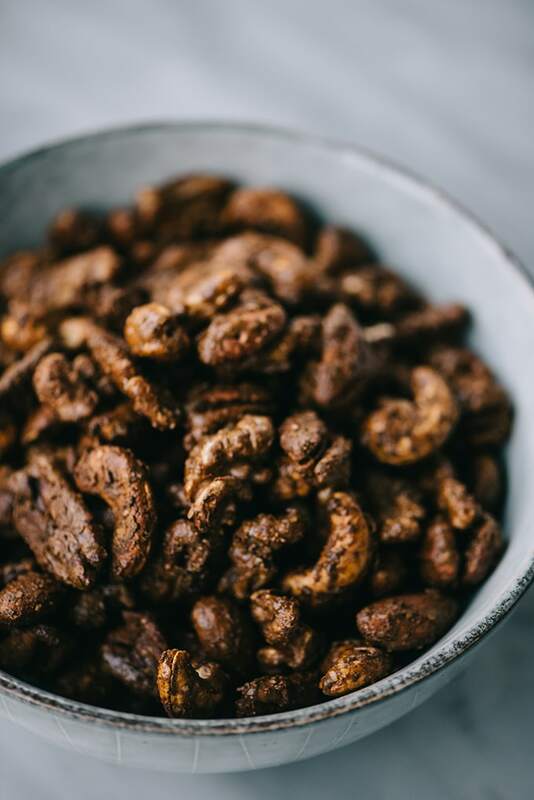 It takes a wee bit of work to release the nuts from the parchment and stir them around, and you don’t want to do that in front of a hot oven. Again, a rubber spatula makes this job considerably easier. I hold one corner of the parchment down with my left hand while I stir with my right to make sure the paper (and the nuts) don’t go flying everywhere. It’s not perfect, but it works. If you have a better method, please educate me! 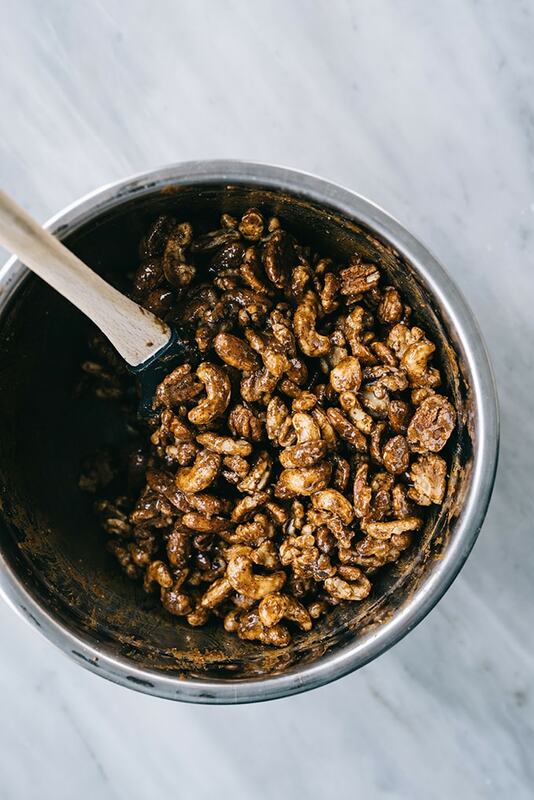 The nuts are done when they’re golden brown and the kitchen smells so good that you’re ready to lick the walls. The nuts are going to feel a little soft when they first come out of the oven, but they’ll crisp up as they cool down. Let them rest on the baking sheets for 10-15 minutes, then transfer to a sealed container. This makes about a dozen servings, a serving size being a generous handful. 2017 OSK Holiday Party Appetizer Week! Looking for more holiday party appetizers? 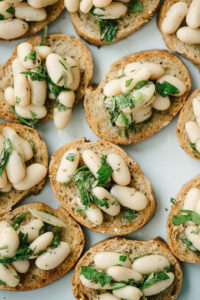 Check out this easy recipe for rosemary marinated white bean crostini, or my 20-minute winter harvest endive cups. Both are elegant, seasonal, crowd-pleasing appetizers. Don’t forget to pop in the rest of the week for more fast, make-ahead cocktail party snacks and appetizers! 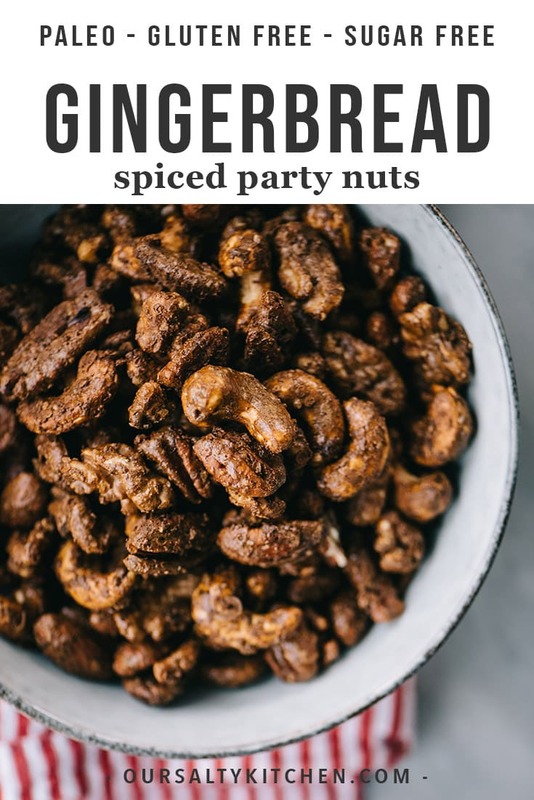 Spice up your holiday party with these irresistibly seasonal gingerbread spiced nuts! They're an easy, make-ahead, crowd pleasing holiday appetizer or cocktail party snack. They require just 15 minutes of hands on time, and can be made completely in advance. 1 lb raw mixed nuts pecans, walnuts, cashews, almonds, etc. Preheat the oven to 300*. Line two baking sheets with parchment paper and set aside. In a large bowl, whisk the egg white until it foams into small, evenly sized bubbles, about 3 minutes. Add the coconut sugar, spices, and salt to the egg white and whisk until incorporated. Add the nuts and mix with a rubber spatula until the nuts are completely coated. Spread the nuts between the two parchment lined baking sheets in an even layer. Transfer to the oven and roast until dry and golden brown, 40 minutes. Halfway through, remove the pans from the oven, stir the nuts with a rubber spatula, then return to the oven to finish roasting. Remove the nuts from the oven allow them to rest on the baking sheets for 10-15 minutes. Transfer to a sealed container, and keep for up to 5 days. Makes approximately 12 servings.